Sea fishing, and shore angling in particular, have been Cinderella subjects as far as UK angling publishing has been concerned in recent years. The most obvious reason is the tremendous decline in catches that has occurred since the sixties, thanks to the failure of EU policy makers to mount any credible attempt to preserve stocks, but that isn't the whole explanation. There are plenty of sea anglers out there - though not as many as there were half a century ago - but as chance or fortune have had it, there haven't been many writers among them. One of the last of the old breed was the incomparable Clive Gammon, who inspired a generation to brave the wind and the waves in search of adventure, but Clive's pen is, I think, now laid to rest. 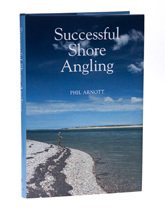 So I was delighted to hear that Phil Arnott had been signed to write a book on shore angling, because if ever there was a subject that demands an up-to-date treatment, surely this is it, a long overdue manual on how to get out there and catch 'em. Successful Shore Angling is an attractive 281 page hardback, copiously illustrated in both monochrome and colour, with helpful line drawings wherever it is necessary to amplify the text. Roughly a third of the book is devoted to Phil's stories about fishing, which cover a wide variety of species and locations, but the remainder is an excellent basic manual about how to go out there and catch fish from the shore, or from an inshore boat. The first chapter offers useful advice on tides, winds and currents and should be compulsory reading for anyone who hasn't spent their life by the sea, this being followed by a summary of the different types of marks and the opportunities they offer, with separate chapters devoted to beach fishing and rock fishing. Following this, Phil gets stuck into methods and tackle, covering float fishing, spinning, fly fishing and match fishing, in each case giving an excellent overview of the subject without going into confusing detail. There is a long chapter on baits and bait collecting, which emphasises what an important role planning takes in this branch of the sport, where many baits are only available on a seasonal basis and even then only at particular states of the tide. Bait quality all too often makes the difference between a cracking day and a disappointing blank and I have often wondered if one of the reasons for the decline in popularity of shore angling is that you can't just pop into a warehouse and buy a packet of celebrity recipe cod boilies. You get a good chapter on UK species, with brief advice on the best methods and bait for each, including a section on the often under-rated grey mullet, which, pound for pound, must be one of the most sporting fish that swim around our coast. Phil rounds off with a section on tackle boxes, rod rests and clothing. Successful Shore Angling is the sort of book I wish I had read when I was a kid. Sure, you can find all the methods in the magazines, but first off all you have to collect the magazines and I was neither patient, nor pecunious enough to build up my knowledge that way. If Phil had written this book forty years ago, I wouldn't have had to learn scything the hard way - I heartily recommend it if you are thinking of taking up shore angling.